A book for all people. And all who read it will be changed by the experience. When Argus leaves home at fourteen every reader will travel with him. And what happens to Argus will resonate deep inside every one of us. Adventure, fear, passion: failure and success. These are the elements of The Journey, a book that dares to be different. 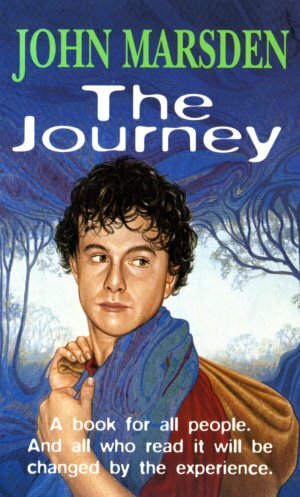 The Journey is a story of young people in a world so different and yet so like our own. It is a world in which young people must undertake a journey of discovery on their way to becoming adults. Argus sets out on his journey away from his valley and his parents, never knowing what adventure will befall him next. He learns how to survive in the wild until he meets with a travelling fair, which he joins, becoming a friend of Mayon the storyteller, of Lavolta and Parara–twins who share the same body–and many others. But it is with the sweet and wise Temora that he learns some of the deepest secrets. All journeys must find an end. Argus leaves the fair and travels on alone, until his last and greatest adventure beckons him home. There he tells, for the approval of his elders, the seven stories which are now his story. But all is not done. There is one more chapter to be lived out in the story of Argus.